Here's the first (rough) video preview of the Fumi game (TenshiOni) in production ^_^ It was a bit tough to video for now (will improve the video quality, etc. in the next previews), but you can see a quick glimpse of the gameplay. Though very rough video, I hope you all like it thus far. It still has the backgrounds and enemies of the Space Game Kit but you can see a bit has changed. 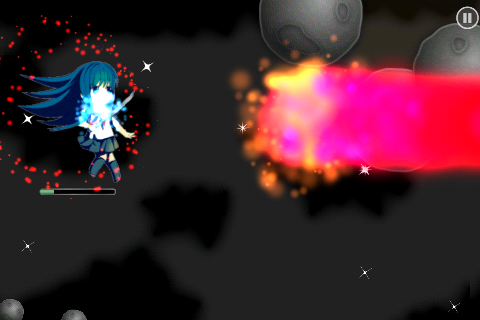 The main character of the game, Fumi has the ability to transform into an Angel, Demon or back her normal state. Each form has advantages/disadvantages based on the enemies she is facing. You can see that some of the blast/hi animations change based on the strength of the hit. Sprites are still pending but some of the dynamics of her transformations have been added; a two-finger tap changes her form, Red aura representing Demon, White-- Angel, None--Normal. Her movement is controlled by the accelerometer (but was a bit tough to film at the moment ^^;;) A left to right swipe is a sword attack and if you hold down an attack, she charges up and can release a charged blast that differs in color based on her form (akin to say, the Megaman xBuster). Not seen is a "Super Mode" that will last for a short period of time that boosts the player's power. This is being tested and was recorded on my old 3G iPhone so there's a slight bit of lag due to mainly the 3G's processor slow handling of particle effect arrays. It runs very smooth on the 3Gs and above.